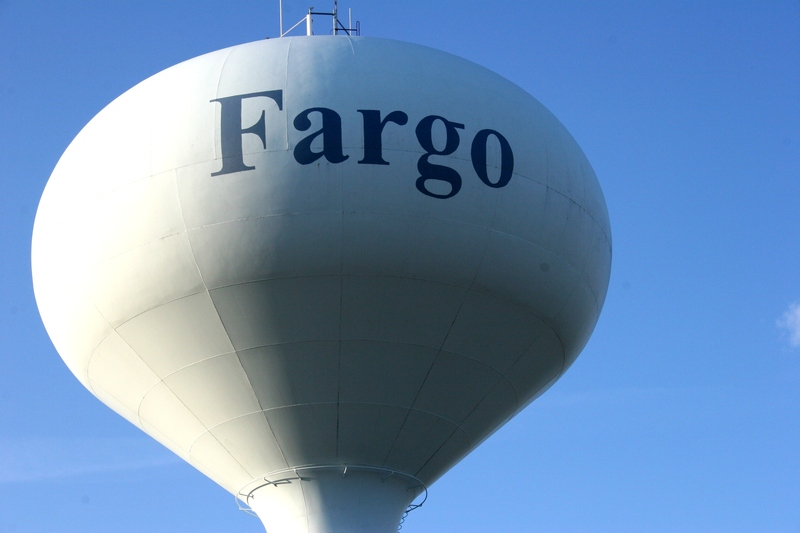 This water tower is located in West Fargo, an area of shopping malls, restaurants, Big Box stores, hotels, etc. Minnesota Prairie Roots file photo. 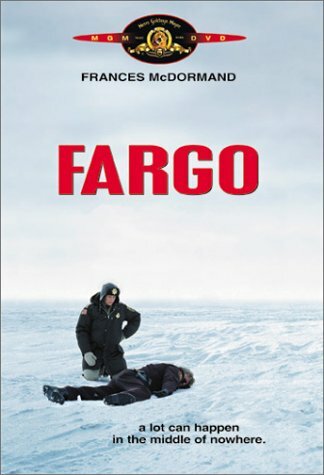 TWO DAYS AFTER I FINISHED reading Marc de Celle’s book, How Fargo of You, a 10-episode mini series, Fargo, debuted (yesterday) on FX television. Excellent. Timing is everything. I receive my TV reception from a rooftop antenna, so there will be no watching Fargo for me. Rather I have to rely on synopses and reviews posted online. The series plays off the Coen brothers’ (native Minnesotans Joel and Ethan) 1996 award-winning film by the same name. (Click here to read my review of that movie.) The Coens are two of the executive producers for this new show penned by Noah Hawley and featuring Oscar winning actor Billy Bob Thornton. The VHS cover of the movie Fargo. You can expect dark comedy, crime, stereotypes and that noted, albeit not fully accurate, Fargo accent. About half of the Fargo series is set in fictionalized Bemidji, Minnesota. Since I haven’t seen the new series, I can’t accurately review it. But I can talk about de Celle’s book. He’s also written a follow-up, Close Encounters of the Fargo Kind, which I’ve yet to read. This is a compilation of others’ stories rather than simply his own. In summary, de Celle, who moved with his family in 2005 from Phoenix to Fargo, writes about his personal “How Fargo of You” experiences in his first book. That’s the tag line he’s attached to unfamiliar and unexpected positive experiences in his new home. He’s not a Fargo native, his closest ties to the region in his Wisconsin native wife and her best friend, Melody, who lives in Fargo. That friend initially drew the family to Fargo for a visit. So de Celle views this area of the country with a perspective of someone unaccustomed to, as he defines it, Northern Prairie Culture. And, yes, that includes Minnesota. 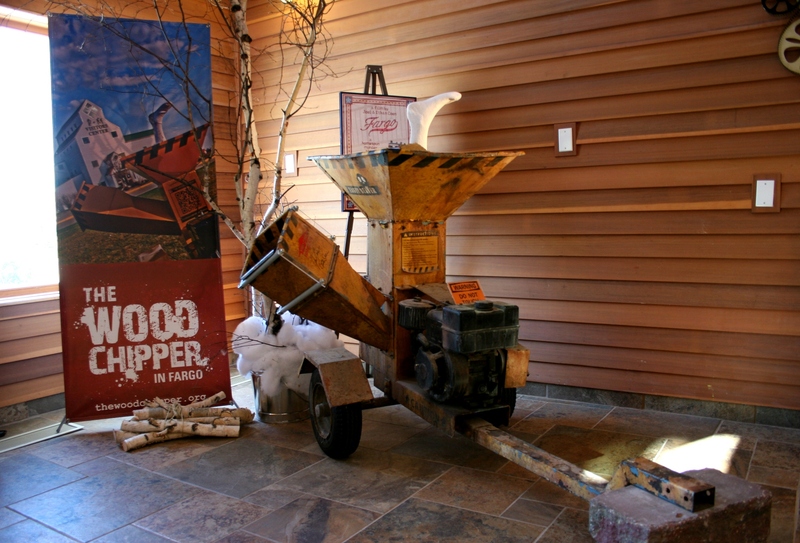 The famous woodchipper from the movie Fargo is a focal point in the Fargo Visitors Center. Other film memorabilia is also on display. Minnesota Prairie Roots file photo. And that’s exactly what you’ll read in de Celle’s first book—a compilation of all that is good about Fargo folks, and those living within several hundred miles of this North Dakota/Minnesota border town. Shortly after the de Celle family arrives in their new community just outside of Fargo, they encounter their first Fargo moment in teenagers helping unload their belongings. And the neighbor-helping-neighbor stories and overall niceties of the region’s people just continue from there. From the pump and then pay at the gas station, to the shared story of a Minnesota farmer assisting college students with a flat tire and the farmer’s wife then preparing a little lunch to motorist merging courtesy to homemade rhubarb pie served at a rural restaurant where a stranger picks up the tab for a cashless de Celle to Fargo residents’ efforts to save their community from the flooding Red River and more, you will read stories that warm your heart. A scene from downtown Fargo. Minnesota Prairie Roots file photo. This is truly a feel-good book, one which makes you thankful, for the most part, to live in this region of the U.S.
De Celle does note, though, the environmental realities in Fargo’s harsh winters, the flat landscape and the strong and endless wind. I especially laughed at his fly-clinging-to-the-windshield wind story given my son spent his first year of college at North Dakota State University on Fargo’s particularly windy north side. In February 2013, I received this text from my then 19-year-old: “This cheap Walmart hat stands zero chance against the Fargo wind.” He then proceeded to order a Russian military surplus fur cap online to replace the mass-manufactured stocking cap. 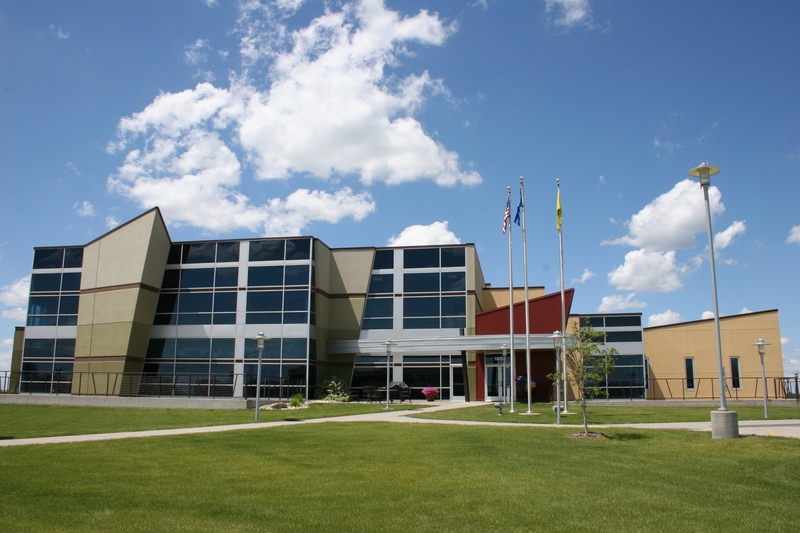 The NDSU Technology Incubator referenced in de Celle’s book. Minnesota Prairie Roots file photo. I’ll agree that the modern architecture looks pretty sleek situated next to open fields where the wind does, indeed, blow with determined fierceness. 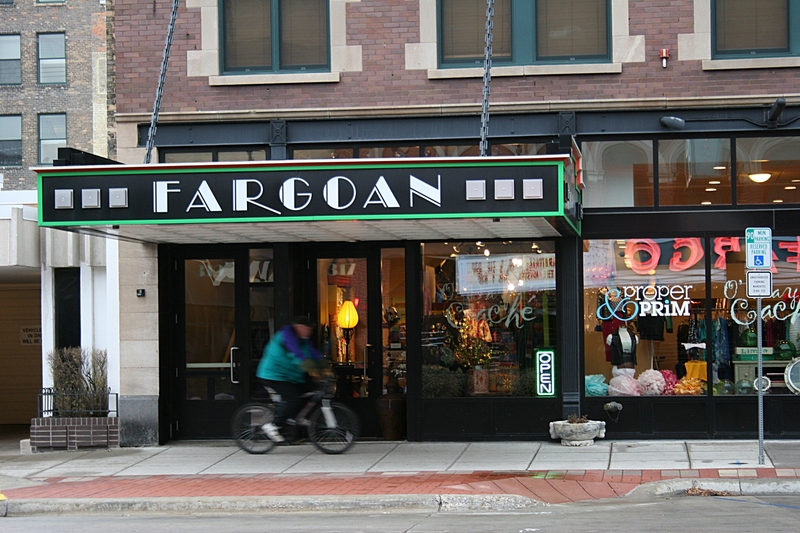 A view of the 300 block on North Broadway in downtown Fargo, including signage for the Fargo Theatre, built in 1926 as a cinema and vaudeville theatre. The theatre is on the National Register of Historic Places and serves as a venue for independent and foreign films, concerts, plays and more. Minnesota Prairie Roots file photo. 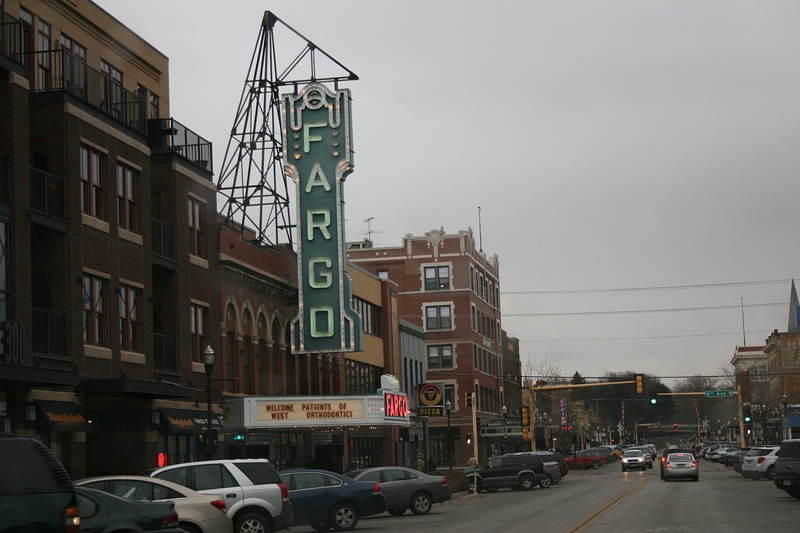 In the time shortly before my son moved to North Dakota and in the nine months thereafter, I got to know Fargo somewhat. It is the charming downtown, with its mostly old buildings, which most endears me to this community. And the people. They were, as de Celle has found, always kind and friendly. He does expose, though, one issue—that of a workforce he terms as “the most overqualified, underpaid, competent and ethical” in the U.S. “Underpaid” jumps out at me, when really “overqualified, competent and ethical” should. Then de Celle balances this with his summation that the majority of folks in Fargo value relationships over stuff. That apparently partially explains why people choose to live in Fargo when they could earn more money elsewhere doing the same job. Now that’s my kind of place, my kind of people. 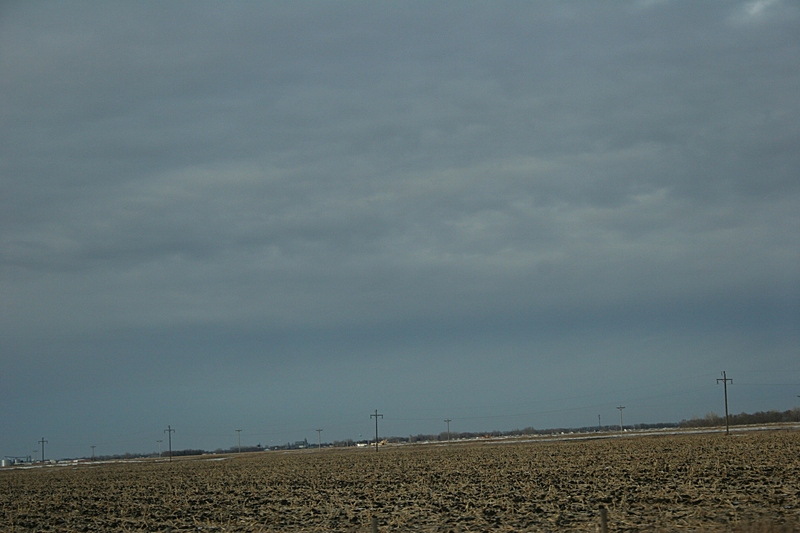 The landscape: flat and into forever in the Fargo area. Minnesota Prairie Roots file photo. But I’m going to be honest here. Even though I grew up on the southwestern Minnesota prairie, which I thought to be about as flat and open sky country as exists, I found the landscape of Fargo even flatter, the wind more fierce, the environment harsher. Every visit to Fargo, I felt unsettled. Like my son before me, I doubt I could last more than a winter in North Dakota. Rather, I live across the border nearly 300 miles to the south and east, still within Northern Prairie Culture in a state known for “Minnesota Nice.” Probably a lot, I’ve concluded, like “How Fargo of You” nice. Disclaimer: Author Marc de Celle purchased one of my photos for usage on his website and gave me complimentary copies of his two books. That, however, did not influence my decision to write this review or the content therein. Phoenix to Fargo – that is big change. Nice review; it makes me want to read a book for a change. I spend a considerable amount of time reading blogs and other photography and technology publications, websites, etc. Here’s an endorsement: My husband, who seldom reads a book, is currently reading How Fargo of You. That area is very hard to describe adequately if a body has not experienced such topography!!! My first jaunt that direction was years ago on our way to Winnipeg. I told DH that I loved our time in the picturesque Canadian town but was there possibly a way to get there that would bypass some of the “in between”!!! Of course, he said not really!!!!! LOL!!!! Look forward to checking at the library for the publications. A great share/review. I’ll have to check the TV listings for the program, also. A journey to Winnipeg would be a long and weary one through a lot of “middle of nowhere” space. Here’s a little personal story: The son applied to and was accepted into college in Winnipeg. He seemed pretty set on going there for awhile. What finally ended that idea was the lack of financial aid for non-Canadian residents. Well, he made it half-way there, to Fargo. I have a brother-in-law who long-distance trucks from the Cities to Winnipeg a lot. It’s his main destination. He was hoping for Southern points this winter, but they needed truckers with experience driving in winter. The trek=ugh!! The city is gorgeous!!!! There’s really a lot to do and see……once you survive the monotony!! We have many biker friends in ministry in that town and surrounding area. I am not mentally stable enough to live up there!!!!! LOL!!! In all seriousness, I think you hit the nail on the head. It takes a certain mental fortitude to live in some locations/environments. Either that or a comfortable familiarity with the place, such as having grown up there. I agree!!! BUT the food is fabulous in that town/city!!!!! Yes, we ate our way through it!!!!! Should I be surprised? I’m not. What’s the food specialty in Winnipeg? Ah, good, basic home-cooked food then. Yup!!!! A few served “family style”. This is a very enjoyable post. I’ve never been to North Dakota, but it does strike me as a harsh place to live. A cousin of mine has family in North Dakota (they are farmers), and they seem quite happy there. I do wonder how her aunt coped all those years ago when she moved to ND from Tennessee. Quite a change. I guess North Dakota isn’t exactly what it used to be, though, with the influx of oil people/workers. I heard on NPR yesterday that crime has increased exponentially in some of those small towns. Those changes you reference are further to the west in the oil drilling region. Lots of people have come from all over the country to work in the N.D. oil fields. Not enough housing. Long hours. Long time away from family. All combine to create challenges in these communities which aren’t designed for such an influx of people. Loving your post – have to check out the book – thanks so much for sharing:) North Dakota is not on my places to live either. Happy Hump Day! Check out the book, for sure. I will do that. I watched the TV Show Fargo last night – a lot darker than I thought it would be and had me pretty much guessing at each and every turn too. Interesting to hear your take on the TV show. I just received an email from Marc de Celle. He is donating a total of $5,000 to a number of North Dakota charities, $1 from the first 5,000 books sold. I watched the TV premier episode of Fargo last night. It is officially my current favorite tv show. Thanks for the review, Kevin. I hope you caught my Owatonna quilt post. Yes, indeed, we saw the interesting quilts and interested quilters pictured. Nicely (and sneakily) done. I couldn’t resist. Sylvan Durban gave me the OK to photograph visitors, as long as I did just side and back shots. Alright, I can do that and be respectful. Beautiful quilts, weren’t they? I hoped to catch up with you, but was focused on photographing the art before the concert ended. I was expecting a swarm of people viewing quilts then, but that really did not happen. You, BTW, are deserving of a solo gallery exhibit of your quilts. How Fargo of you seems to have a good ring to it,if everyone knew what it meant. You could tell them right away and they could feel complimented. Better than “Minnesota nice” Which too many people think they are but are actually jerks. Oh, my, have you encountered some not so Minnesota Nice today, Randy? Speaking as a Fargo native, I very much enjoyed this post. I spent most of my first 22 years in Fargo and still have family there. During my high school years, I was pretty much convinced that Fargo was the epitome of boring — yet still ended up at Moorhead State, which turned out to be a great decision, despite the fact that it was a little too close to home. That said, in the intervening years I’ve lived a lot of other places — both in the US and abroad — and that time away has given me the perspective to see the many positives of my hometown. Still… every time I’ve been tempted to move “home”, there are two main factors that have kept me firmly planted in the northwest suburbs of Minneapolis: 1) The letters to the editor of the Fargo Forum trend conservative enough to convince me that I’d rather stay in Hennepin County where the progressives reign, and 2) That wind!! I don’t miss that wind!! Jennifer, thanks for taking the time to form such a thoughtful comment. It’s interesting to hear your perspective as a Fargo native. That wind certainly seems to be a defining element of Fargo. No. “Minnesota nice” is a term that is over-used and some ego-driven people think they are. After all everyone is “nice” and “good” in their own mind. I think the extra flat emptiness makes people that much happier to see each other – nothing fills the void as well as another person. The harshness of winter and wind add to the natural agrarian motivation to look after each other. There are a lot of reasons why the Northern Prairie Culture has developed the way it has, and I’d love to see us study it more. It wouldn’t hurt to know how we might make other places a little more Fargo. I see evidence of this culture from Green Bay to Lincoln to Calgary (but not in Wyoming, interestingly, where cattle ranchers were all hiring Tom Horn and the like to shoot each other a century ago). I really enjoy snooping into it and writing about it. Thanks for the very thoughtful review, Audrey. You’re welcome, Marc. You’re correct in stating that the landscape/environment can pull people together, or, I also think, drive them away. Right, Audrey. I hate the old adage, “Keeps the riff-raff away,” referring to the harsh winters, but there is an acorn of truth — if you don’t have patience or you can’t nurture it, as well as number of other virtues, you won’t stay around here. But the stories that illustrate this deeply are the ones of young folks moving away after graduation, but then returning once they start having kids, even taking reduced salaries along with the tough winters — all so their kids can grow up in a safe, sane place. That’s why we moved here and we weren’t even from here! And when you end up with a population whose values lean heavily in that direction, you get a little bit of heaven on earth, not despite the cold winters, but largely because of them. A lot of people I know can’t understand why I love the prairie so. Now, I’m talking southwestern Minnesota prairie, not North Dakota prairie, although they certainly are similar. But the Minnesota prairie is where I grew up and the older I grow, the more I appreciate the values instilled in me there and the strong sense of place that shaped the writer and photographer I’ve become. You notice details when you live on the prairie. And certainly a strong sense of community exists in this rural region. Just like North Dakota. Yes, Minnesotans, life exists west of Mankato and that would be southwestern Minnesota, of which I’m a proud native. Thus my blog name, Minnesota Prairie Roots. I should probably mention that How Fargo of You has been ebook-only for the last 6 months, and during that time the price of a new print copy has soared to over $100 in the after-market (check Amazon). 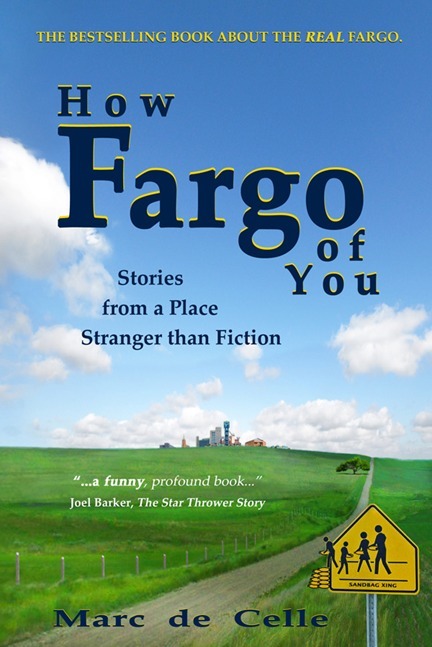 So in response to the mythological Fargo once again capturing the national imagination, I’m making the print version of How Fargo of You available again, so people can learn about the real Fargo — which I think is even stranger than the fiction, in a good way. The book will be back in stores sometime in May, but people can order signed copies in advance off my website now at http://www.realfargo.com. Thanks again, Audrey. There you go, readers. Thanks, Marc, for the additional info. Ah, Fargo! I was born there!, Back there on an off over the years being dragged around by my Air Force father! After I joined the Marines and visited him in Minot, ND. Flat as an ironing board there too. The military gate guards (I was in full uniform complete with leave papers) looked at me like i had come from outer space (Kind of did, former resident of Roswell, NM!). I have found that Fargo was (is?) far more conservative than their sister city Moorhead, MN. The flat lands surrounding both Fargo and Minot are only slightly different than the flat lands of southern New Mexico. Viaduct still there? God Bless you all and wishing all a Happy Thanksgiving! Even though I grew up on the southwestern Minnesota prairie, a mighty flat place, I found Fargo/Moorhead even flatter. I know many people love these two cities. But I could not live there or in Minot.